Home Design & Marketing Is personalization important to labels and packaging? We have all seen the studies and even experienced first-hand the value of personalization in direct mail and other forms of communication. But what about the value of personalization in products and packaging? There are a lot of projections into what the market value ‘could’ be, but how do you take advantage of that? By now we have all seen the studies and even experienced first-hand the value of personalization in direct mail and other forms of communication. But what about the value of personalization in products and packaging? There are a lot of projections into what the market value could be. For example, according to a 2017 study, the expected value of the personalized gift market will increase 55% from 2016 to 2021 to an estimated value of US$ 31 billion. Another study from Deloitte estimates that 50% of Millennial and Gen Z consumers express a desire for personalized products. Or, that 70% of shoppers are willing to pay 10%+ for personalized products. If accurate, that is all great news, but how do you take advantage of that? Purchasing technology to support personalization has been available for a while, and new technology is being released regularly, but it doesn’t answer the questions about which consumers will buy the personalized products and, more importantly, why HP was interested in understanding the ‘who and whys’ and set out on a journey to learn for themselves and to better drive marketing efforts. Ultimately, they would also use that information to develop tools to help drive the need and then identify and target those opportunities for their service provider customers. A recent HP-funded study performed by sparks & honey, a consultancy division of Omnicom attempts to identify and better define those drivers and potential opportunities. The study, ‘Exploring Personalization,’ produced in September 2018, studied over 45 million online conversations in four markets (US, China, Germany, and France) and looked at six unique drivers. These six drivers were determined to represent the way that consumers view themselves in relationship to their product decisions. The HP Personalization Pinwheel shown below identifies each of the drivers. While it may seem a little abstract at first, if you look at each of these drivers you can probably see how you and others could identify with each of these. Each of these segments shows the percentage of total respondents that align with each of them. However, the study also found that while the desire for personalization transcends generations, there is a definite difference in how much each of the generations desire personalization, and which of the drivers are more important to them. 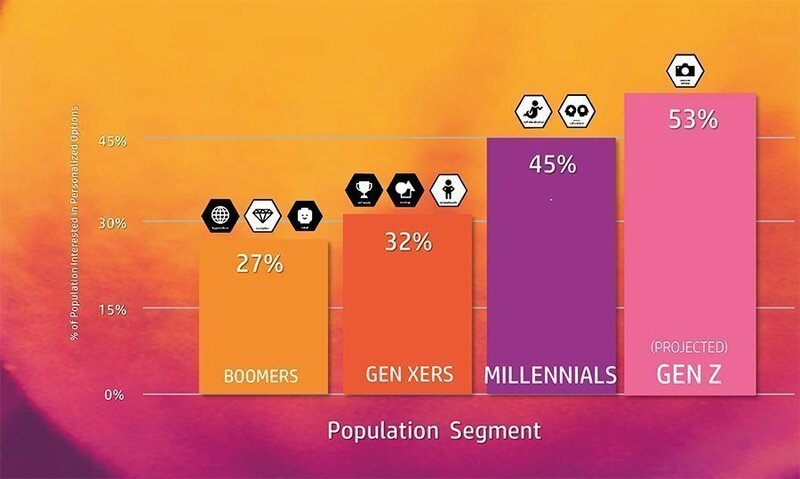 The Gen Z group shows over 50% are open to and even desire personalization. Ultimately, each of these drivers can be matched to specific types of personalization efforts that can be further refined through the information in the full study. Not all markets lend themselves to personalization or, more importantly, not all consumers express the desire to pay for personalized products. In the following chart, respondents expressed a varied willingness to pay a premium for personalized products. HP’s goal is to take the information developed from this study and work first with the agencies and then the brands to help educate and inspire them to not just the value of personalization, but more importantly to the drivers so they can make good decisions. This in turn should trickle down to the service providers for production. The study is made available to HP ‘partners’ for a fee. While this study may not be directly targeted at print service providers, it is probably one of the first studies to provide some clarity to consumer awareness and purchasing decisions around personalization. 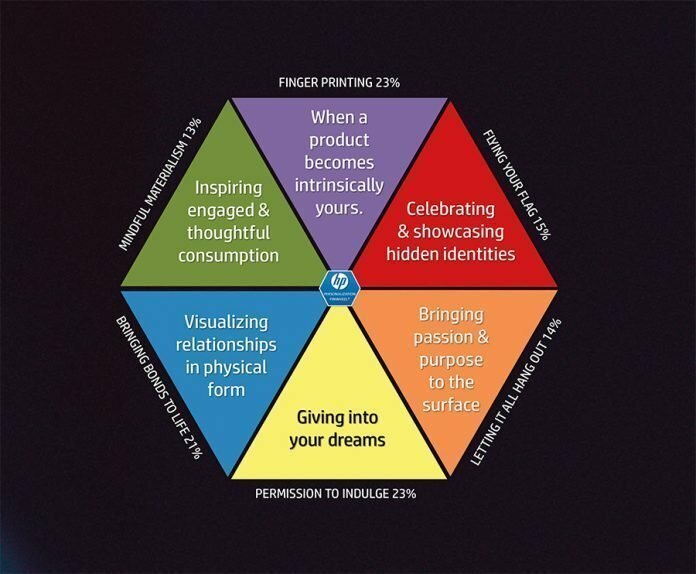 As service providers continue to look for new ways to engage their customers and drive more print through their digital presses, this is very valuable information. Currently, the vast majority of purchasing is done by the Boomers and Generation X. However, the Millennials and Generation Z are the future, and understanding drivers, buying habits, trends and preparing for them will undoubtedly provide a good platform for growth. I would like to address your interests and concerns in future articles as it relates to the manufacturing of Print, Packaging and Labels, and how, if at all, it drives future workflows including ‘Industry 4.0.’ If you have any interesting examples of hybrid and bespoke manufacturing, I am very anxious to hear about them. Please feel free to contact me at david@zwang.com with any questions, suggestions or examples of interesting applications. First published 19 March 2019 by www.whattheythink.com. Reproduced by permission of the author.